Finally! I got time to blog about my Korea Trip in Oct! I’m back to Singapore for almost 3 weeks already, misses Korea so much! Going to back to Seoul most probably next year for Super Show 5! Will blog about my experiences at SMTown soon! Stay tune ok? Departed to Incheon Airport on 8am flight via Singapore Airlines at Changi Airport Terminal 3! Love the in-flight entertainment of SIA, lots of new movies! Can never be bored throughout the whole flight! 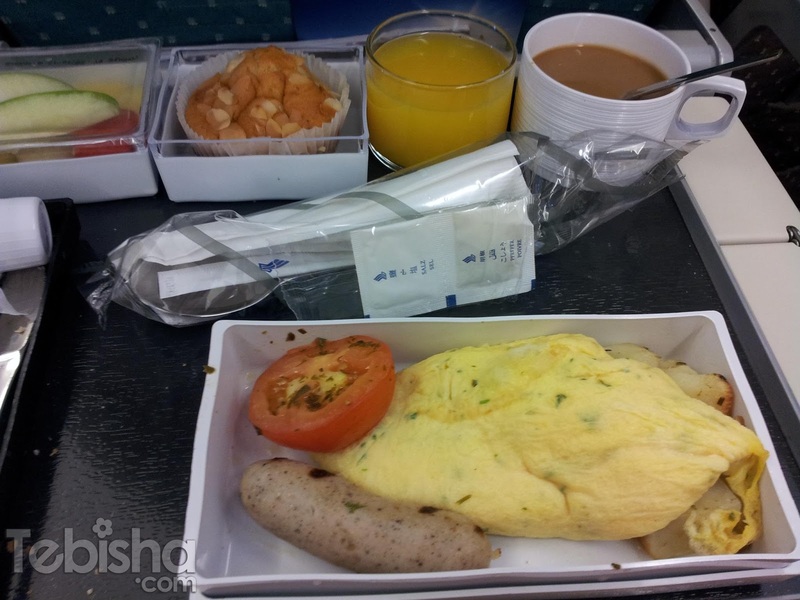 In-flight meal, Breakfast was served, Omelette with Sausage. 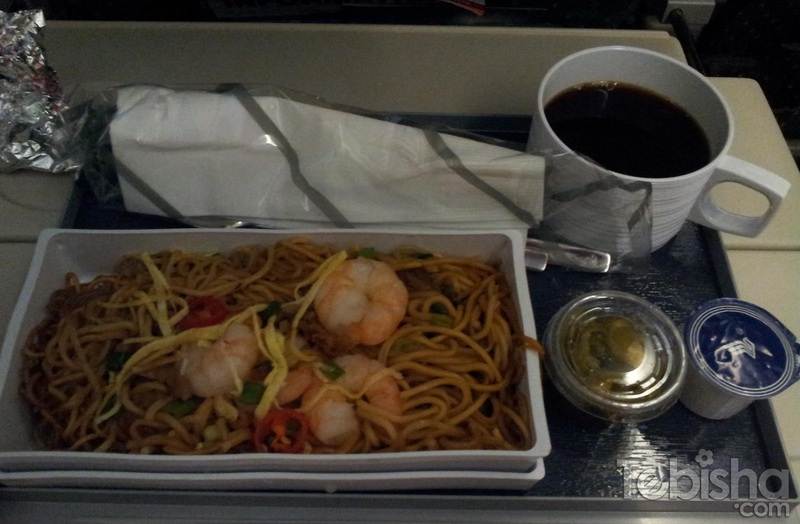 2nd meal on the flight, Fried Noodles with Coffee! I love this! 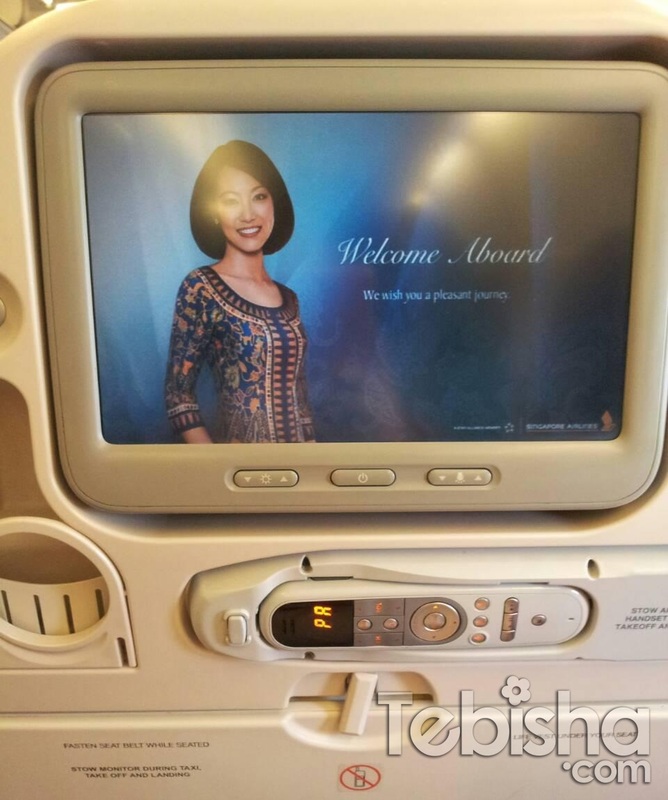 Had a really great experience with SIA, superb service, in-flight meals & entertainment! It’s worth every penny of it! After 6 hours 25 mins of flight, finally touched down Incheon Airport at around 3.30pm KST! Korea time is 1 hour ahead from Singapore. The first thing we did when we are out of immigration were head to the Telco counter and rent a phone for our data usage during our trip. Initially, we wanted to rent an I-Phone but the counter staff told us I-Phone was not available right now. So we decided to go with pocket wifi which is the more economical choice. In Korea, they do not sell any SIM card for data usage, their pre-paid SIM cards are only for calls and SMS. If you require to use data for your smart phone, you can either rent a smart phone or pocket wifi to access data / internet services. The Telco we rented our pocket wifi from is Olleh KT. 8,000 won per day for unlimited data usage. The pocket wifi I rented can use up to 3 users, so if you going with your friends you guys can share the rental fees! Which is cheaper than you rent a smart phone there. * Do take note, pocket wifi is only for data usage, if you wanna make calls or SMS in Korea, it going to be costly! So if you need to make calls, you can get a pre-paid SIM card separately. After settled our pocket wifi rental, we going to take the Incheon Airport Bus to Seoul. Bus ticket cost around 15,000 won per trip. Tickets can be purchase at the ticket counters just outside the exits of Incheon Airport. We took bus 6703(Gangnam Yeoksam) to Yeoksam area which our Hotel located at. Checked in to Tria Hotel at around 6.30pm. Due to the rain and heavy traffic, the Airport Bus took more than 1.5 hours to reach our stop. Our room for our 1st and 2nd night in Seoul. Standard room type. I booked my hotel rooms via Agoda.com, very trustworthy! Standard Room is not fantastically big but just nice for 2! Clean room with comfy bed and huge LCD TV! Everything in the room can control via 1 remote control! Air-conditional, TV and even lights can control via the 1 controller! 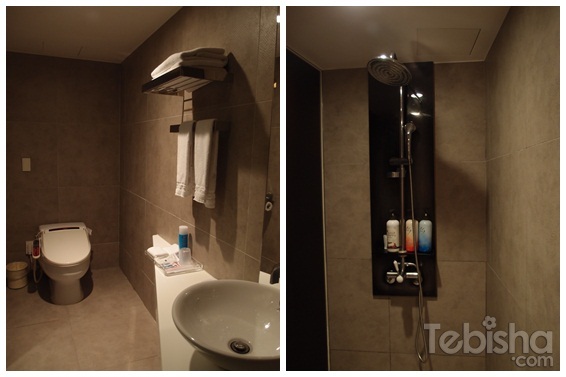 You don’t have to walk all the way to the wall switch to switch off the lights! Toilet Bowl with seat warmer and washing system! Shower with rain shower head! Overall, I’m quite satisfied with room and amenities provided. 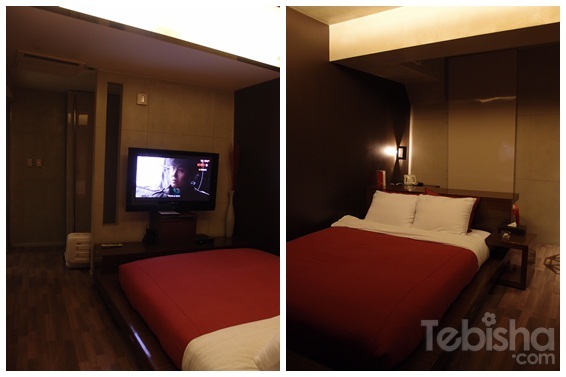 Tria Hotel is quite near to Yeoksam subway station, 5 mins walk only! After settled our luggage in the room, we need to head out real soon to get our dinner! We were hungry to the max + I have been craving for Kyochon chicken for months! I need to eat it when I reach Korea! The KyoChon outlet we went to was located at Apgujeong. Exit via Apgujeong Subway Station Exit 2, 15 mins walk. Super Junior endorse for KyoChon Chicken. Posters all around in Kyochon chicken. Spicy on the left, Original on the right. I couldn’t take the spiciness after eaten a few pieces. Koreans love to take beer with fried chicken! Best to go with Korean Beer! Damn shiok!! Look! How happy I am with the fried chickens and beer! Taste like heaven! After dinner, we headed to Kona Beans which is nearby! Apgujeong Kona Beans outlet is a must-go place for me whenever I’m in Seoul. If you have follow my blog closely, you will know I’m a big Super Junior Fan! This Kona Beans outlet was opened by 3 of the Super Junior members’ mothers! Leeteuk, Sungmin and Kyuhyun’s Omma! My first time visit Kona Beans at night! Spot lights really bright shinning at the sign board! It’s my 3rd visit to Kona Beans! Super Junior Posters and Gifts from Fans are displayed in the cafe as well! Kyuhyun’s Omma was there when I reached Kona Beans! She looked pretty stress and calculating some figures, so decided not to disturb her. Bought a take away drink and left Kona Beans in a hurry, cause we need to rush to Myeongdong to meet my friend collect some Super Junior stuffs that she got for me and meeting my BFF’s friend there as well. Just happened that both of our friends were at Seoul when we reached. But they got to leave the next day when we arrived, that’s the reason why we need to meet them on our first day! Day 2 – Cafes Hopping and Shopping in Myeongdong & Dongdaemun! Yes flew SIA once,,It awesome..